Oral traditions trace the origin of Hawaiian luakini temple construction to the high priest Pā‘ao, who arrived in the islands in about the thirteenth century. He introduced several changes to Hawaiian religious practices that affected temple construction, priestly ritual, and worship practices. Mo‘okini temple was last active as a war temple for Kamehameha I in the last two decades of the 18th century. It is said to have housed the Kamehameha family war god, Ku-ka-‘ili-moku, and this feathered god transferred to Pu‘ukohola Heiau, in 1791, when Kamehameha built this new war temple to assure his conquest of all the Hawaiian Islands. According to Stokes, Mo‘okini Heiau was said to have been built from stones brought from Pololu Valley. It was believed that the stones were passed hand-to-hand by men standing in a line spanning the 15-mile distance from the valley. By the time of contact, numerous coastal villages and extensive dryland agricultural systems were in place in North Kohala. This farming system lasted for several centuries and provided taro and sweet potato (the food staples of the time) to the growing population. When that ended in the 1800s, it was followed several decades later with the commercial production of sugarcane that lasted for over 100‐years. Sugar production stopped in Kohala in 1975. On June 25, 1927, an Executive Order set aside nearly 38-acres of the property for an airplane landing field for the US Air Service to be under the management and control of the War Department. In 1933, the Army named it Suiter Field, in honor of 1st Lieutenant Wilbur C Suiter who was killed in action serving in 135th Aero Squadron. Suiter Field was first licensed in 1928. It was also alternatively referred to as Upolu Point Military Reservation, Upolu Landing Field, Upolu Airplane Landing Field and Upolu Airport. Pā‘ao is reported to have introduced (or, at least expanded upon) a religious and political code in old Hawai`i, collectively called the kapu system. This forbid many things and demanded many more, with many infractions being punishable by death. Since, in this context, eating is for men a sacrifice to the male akua (god) Lono, it must be done apart from anything defiling, especially women. Thus, men prepared the food in separate ovens, one for the men and another for the women, and built separate eating houses for each. The kahuna suggested that the new ʻaikapu religion should also require that four nights of each lunar month be set aside for special worship of the four major male akua, Ku, Lono, Kane and Kanaloa. On these nights it was kapu for men to sleep with their wahine. Moreover, they should be at the heiau (temple) services on these nights. Certain places were set apart for the husband’s sole and exclusive use; such were the sanctuary in which he worshipped and the eating-house in which he took his food. Following the death of Kamehameha I in 1819, Liholiho assented and became ruling chief with the title Kamehameha II and Kaʻahumanu, co-ruler with the title kuhina nui. Keōpūolani, another of Kamehameha I’s wives, was the highest ranking chief of the ruling family in the kingdom during her lifetime. She was a niʻaupiʻo chief, and looked upon as divine; her kapu, equal to those of the gods. (Mookini) Giving up the ʻaikapu (and with it the kapu system) meant her traditional power and rank would be lost. The ʻainoa following Kamehameha’s death continued and the ʻaikapu was not put into place – effectively ending the centuries-old kapu system. Some have suggested it was the missionaries that ended the kapu that disrupted the social/political system in the Islands; that is not true. The American Protestant missionaries did not arrive in the Islands until the next year (April 4, 1820.) The Hawaiians ended their centuries’ long social/political system. Prior to Western contact, each of the major islands or independent chiefdoms in the Hawaiian chain comprised a mokupuni (island.) Over the centuries, as the ancient Hawaiian population grew, land use and resource management also evolved. Each island was divided into several moku or districts, of which there are six in the island of Hawaiʻi, and the same number in Oʻahu. There is a district called Kona on the lee side and one called Koʻolau on the windward side of almost every island. (Alexander) Another moku (common on a couple mokupuni) is Puna (“well-spring”) – this summary is about Puna on Hawaiʻi Island. This ʻōlelo noʻeau refers to the forests of Puna, which attract clouds to drench the district with many rains, refreshing and enriching the Puna water table, and sustaining the life cycle of all living things in Puna. According to Pukui, in the olden days, people would stick branches of hala into the thatching of their houses to bring some of the fragrance indoors. According to Kamakau, the Island of Hawaiʻi was without a chief when Pāʻao arrived in Hawaiʻi in the eleventh century. Evidently the chiefs of Hawaiʻi were considered aliʻi makaʻāinana (commoner chiefs) or just commoners, makaʻāinana, during this time. Alexander later (1891) noted, “The first settlement met with after leaving Hilo by the sea coast road, is at Keaau, a distant 10 miles where there are less than a dozen inhabitants; the next is at Makuʻu, distant 14 miles where there are a few more, after which there is occasionally a stray hut or two, until Halepuaʻa and Koaʻe are reached, 21 miles from Hilo, at which place there is quite a village”. An historic trail once ran from the modern day Lili‘uokalani Gardens area to Hāʻena along the Puna coast. The trail is often referred to as the old Puna Trail and/or Puna Road. There is an historic trail/cart road that is also called the Puna Trail (Ala Hele Puna) and/or the Old Government Road. With Western contact, extensive tracts of Puna’s landscape were transformed, first with sandalwood export began in 1790, reaching its peak between 1810 and 1825. After Hawai‘i’s first forestry law in 1839 restricted the removal of sandalwood trees, cattle ranching and coffee cultivation became the leading commercial activities. By 1850, agriculture diversified with the cultivation of potatoes, onions, pumpkins, oranges and molasses. Before 1900, coffee was the chief agricultural crop in the area. Over 6,000-acres of coffee trees were owned by approximately 200-independent coffee planters and 6 incorporated companies. Soon, sugarcane was in large-scale production. The dominant operation in Puna was the Puna Sugar Company, whose plantation fields extended for ten miles along both sides of Highway 11 between Keaʻau and Mountain View, as well as in the Pāhoa and Kapoho areas. Initially founded in 1899 as Olaʻa Sugar Company, it was later (1960) renamed Puna Sugar Company. The coffee trees were uprooted to make way for sugarcane. ʻŌhiʻa forests also had to be cleared, field rock piled, land plowed by mules or dug up by hand with a pick. Sugarcane was in large-scale production; the sugar mill operation ran for just over 80 years, until 1984. Macadamia nuts and papaya were introduced in 1881 and 1919, respectively. Since the closure of the Puna Sugar Company, papaya and macadamia nut production have become the leading crops of Puna. About 97% of the state’s papaya production occurs in Puna, primarily in the Kapoho area. Another thing growing in Puna is housing. Between 1958 and 1973, more than 52,500-individual lots were created. There are at least over 40-Puna subdivisions. As a comparison, Oʻahu is about 382,500-acres in size; the district of Puna on the island of Hawaiʻi is about 320,000-acres in size – almost same-same. According to the 2010 census, Oʻahu has about 955,000-people and Puna has about 45,500. That means there are less than a half-acre per person on Oʻahu and over 70-acres per person in Puna. Likewise, most subdivision lots are accessed by private, unpaved roads. The streets generally lack sidewalks and lighting, and do not meet current County standards in terms of pavement width, vertical geometrics, drainage and other design parameters. I was saddened when the news broadcast the first house lost to the ongoing lava flow – a home of a friend and former student from Parker School. I have been debating about posting on Puna – but decided that as the lava flows there, we should reflect on its history, but also be sensitive to and respectful of the trauma facing many of the families there – they are going through situations many of us will never have to face. 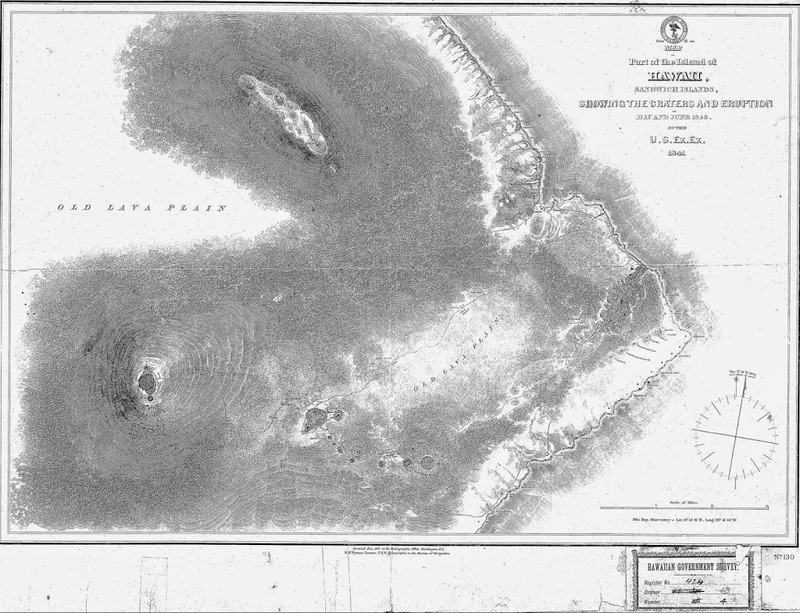 The image shows the Wilkes 1840-1841 map of Puna. In addition, I have added others similar images in a folder of like name in the Photos section on my Facebook and Google+ pages. Papa and Wākea are the ancestors of the Hawaiian people. “Papa” in Hawaiʻi is “a word applied to any flat surface,” especially to those undersea foundation layers from which new lands are said to rise. This probably relates to the successive generations of mankind born out of the vast waters of the spirit world and identified through their family leaders with the lands which they inhabit. 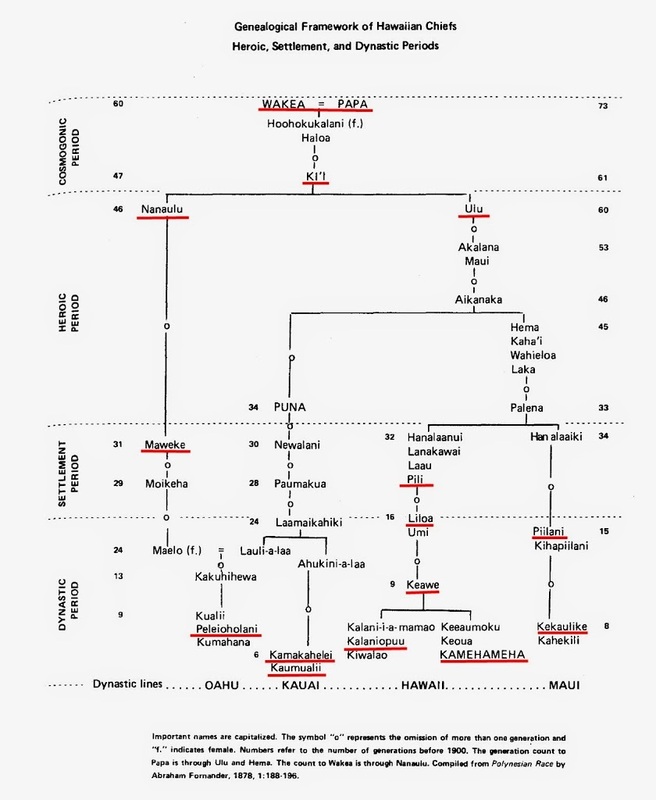 Thirteen generations after Papa and Wākea, Kiʻi and his wife Hinakoula appear. Kiʻi was king in the Southern Pacific Islands – at Tahiti, the chief island of the Society group. (Westerfelt) They had two sons, Nanaʻulu and Ulu – they came to the Hawaiian Islands and established a dynasty of high chiefs. About AD 1100, thirteen generations from Nanaʻulu and Ulu came Maweke of the northern Nanaʻulu line. Maweke is one of the main figures in the voyaging era of Hawaiian traditions. With Maweke, the lineage of ancient Polynesia was transformed into a distinctly Hawaiian lineage. Likewise, about this time on the Island of Hawaiʻi, the island was divided into competing district-sized chiefdoms. In general, there were three centers of power during this period: Waipiʻo Valley in the windward region, Kona in the leeward area and Kohala on the northern end of the Island. Kūkaniloko, the sacred place of birth on the central plateau may have been constructed by the late-AD-1300s. A divine center for Nanaʻulu chiefs, to be born at Kūkaniloko signified legitimacy. It is said that chiefs from other islands often sought greater prestige by marrying those with these strong ancestral lineages. Pāʻao (ca 1300,) from Kahiki (Tahiti,) is reported to have introduced (or significantly expanded,) a religious and political code in old Hawaiʻi, collectively called the kapu system. This forbid many things and demanded many more, with many infractions being punishable by death. Certain religious kapu were permanent and unchangeable, relating to customary rites, observances, ceremonies, and methods of worship, and to the maintenance of the gods and their priests. The social order of old Hawaiʻi was defined by these very strict societal rules, do’s and don’ts. Prior to his death on May 8, 1819, Kamehameha decreed that that his son, Liholiho, would succeed him in power; he also decreed that his nephew, Kekuaokalani, have control of the war god Kūkaʻilimoku. Kekuaokalani, Liholiho’s cousin, opposed the abolition of the kapu system and assumed the responsibility of leading those who opposed its abolition. These included priests, some courtiers, and the traditional territorial chiefs of the middle rank. The two powerful cousins engaged at the final Hawaiian battle of Kuamoʻo. In December 1819, just seven months after the death of Kamehameha I, the allies of his two opposing heirs met in battle on the jagged lava fields south of Keauhou Bay. Liholiho had more men, more weapons and more wealth to ensure his victory. He sent his prime minister, Kalanimōku, to defeat his stubborn cousin. Kekuaokalani marched up the Kona Coast from Kaʻawaloa and met his enemies at Lekeleke, just south of Keauhou. The first encounter went in favor of Kekuaokalani. At Lekeleke, the king’s army suffered a temporary defeat. His wife Manono fought and died at his side. 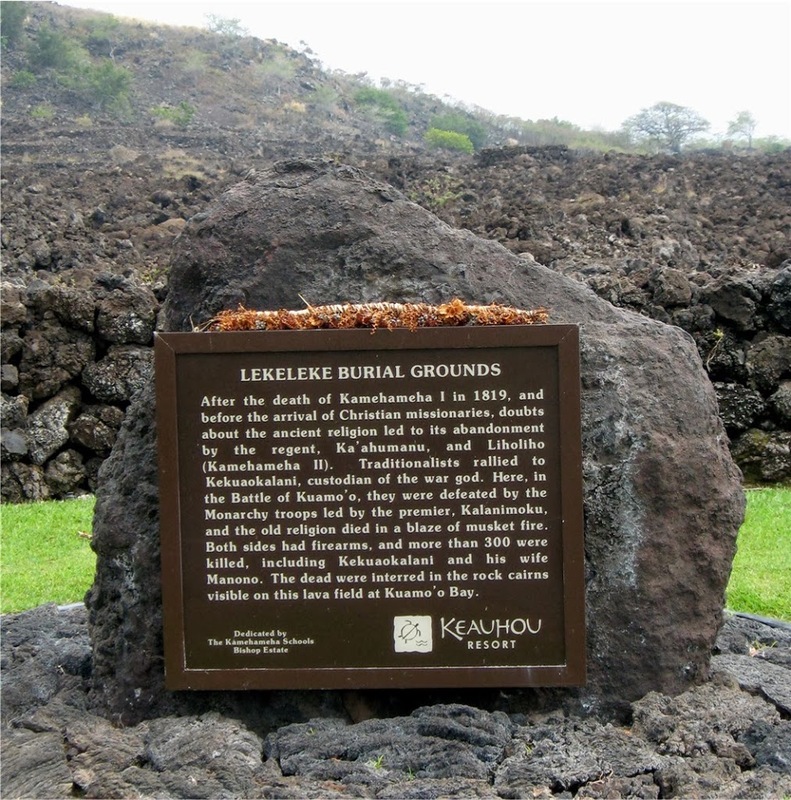 Liholiho ordered the bodies of his men to be buried beneath the terraced graves at Lekeleke; Kekuaokalani’s dead warriors were buried there, as well, and Liholiho pardoned all surviving rebels. It was estimated that hundreds of people were killed in this battle, the last fought in Kona. The burial ground of the fallen warriors of the battle of Kuamoʻo is at Lekeleke at the southern terminus of the present day Aliʻi Drive. The battle of Kuamoʻo effectively crushed any hope of reviving traditional Hawaiian religion and its accompanying kapu system. This changed the course of their civilization and ended the kapu system (and the ancient organized religion,) and made way for the transformation to Christianity and westernization. Liholiho and the others did not know that at the time that the kapu was broken and battle was waged, the first of the Protestant missionaries were on the ocean on their way to the Islands. On October 23, 1819, the Pioneer Company of American Protestant missionaries from the northeast US set sail on the Thaddeus; after 164-days at sea, on April 4, 1820, the Thaddeus arrived and anchored at Kailua-Kona. The image shows the Kuamoʻo Lekeleke Burial Memorial. More images are added to a folder of like name in the Photos section on my Facebook and Google+ pages.